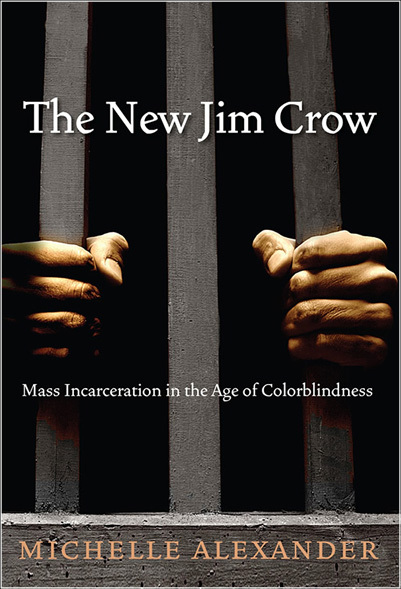 The New Jim Crow: Mass Incarceration in an Age of Colorblindness by Michelle Alexander, The New Press, 2010, 312 pp. There is so much to say about this book that I don’t know where to begin. I finished reading it months ago, and the prospect of writing this review was so daunting I got way behind on all my reviews. You just need to go read this book for yourself, because it is a seminal summary of the social mechanism of mass incarceration, and the way it is exercising social control in communities of color in the United States. This can be such a hot topic that I fear people will read this review, react negatively, and begin to respond without actually reading the book—where Alexander has the space to actually make the case. So, let me say again, READ THE BOOK. If you think racism isn’t systemic, read this. If you think we’ve taken care of civil rights issues, read this. If you think prisons are full of “bad” people, read this. If you care about social justice, racism, youth at risk, the war on drugs, voting rights, for-profit prisons, read this. Alexander begins with a history of social systems that functioned to control and oppress black people in U.S. history and create a racial caste system that preserves white privilege. The first, obviously, was slavery. Slavery replaced indentured servitude and served to create a racial caste system that separated poor whites and blacks by according privileges to whites. When slavery was abolished, Jim Crow segregation took its place, maintaining the racial caste system. After the Civil Rights movement, Alexander details how the rhetoric of “law and order” replaced segregation as a system of racial control. Stereotypes of black “welfare queens” and criminal “predators” proliferated. Massive job loss in inner cities was accompanied by the rise of crack cocaine. The law and order rhetoric responded with the War on Drugs, including mandatory minimum sentencing and exploding budgets for law enforcement and prisons. Mass incarceration is born, and millions of people—with a massive preponderance of men of color–are placed under the jurisdiction of the prison system. It’s not just about the time spent in prison, but about the time spent on probation and the permanent second-class citizenship of a prison record. And that’s only the first chapter. If this seems absurd to you, I have only one reply: go read the book. Then we can talk more about it. The final chapter, “The Fire This Time,” points some direction for a New Civil Rights movement with overturning the system of mass incarceration as its target. There are many obstacles, including the economic employment of massive numbers of people in the prison-industrial complex, the stigma and belief that those incarcerated are criminals who deserve their fate, and a long line of court cases that refuse to acknowledge the problem. Reading her arguments in the rest of the book, it seems insurmountable—but it is helpful to remember that segregation seemed insurmountable a mere 60 years ago. And doing nothing is unthinkable for anyone who cares about justice. Michelle Alexander is not the first or only person raising this issue. (My husband reminded me of going to see Angela Davis at a conference on this topic in Berkeley in the lat 1990s.) However, The New Jim Crow makes the argument concisely and convincingly that mass incarceration has replaced segregation as the tool of oppression for communities of color in the post-Civil Rights era. We who care about justice must find new strategies to overcome. READ THIS BOOK. 2 Responses to "Book Review: The New Jim Crow"